I think the crazy happy smiles on our faces say it all. Sunday 20 October 2013 was an amazing day for all of us at Sustainability Consult. It was the day where we felt all our hard work over the last five years pay off. As members of 1% for the Planet, we donate 1% of our sales (yes, that’s sales not profit!) to an environmental non-profit organisation. On that sunny Sunday in October, our first 1% for the Planet project was unveiled. All through 2012, we discussed how our contribution could be best used and decided a relationship with the Flemish NGO, Natuurpunt was the best fit for us. We wanted to build an ongoing relationship and provide support, not just donate money, so a local non-profit made sense. Natuurpunt is doing wonders with nature conservation in the Flanders region of Belgium and they were open to working with an international sustainability communications consultancy like ours. We allocated the funds and the project planning started. Natuurpunt’s goal was to make an existing piece of woodland, the Steentjesbos near Kampenhout, more accessible to the public by adding signposted footpaths and information boards. As a firm whose mission is to communicate credibly on sustainability, we felt that sharing information on nature and biodiversity was really in line with our values. 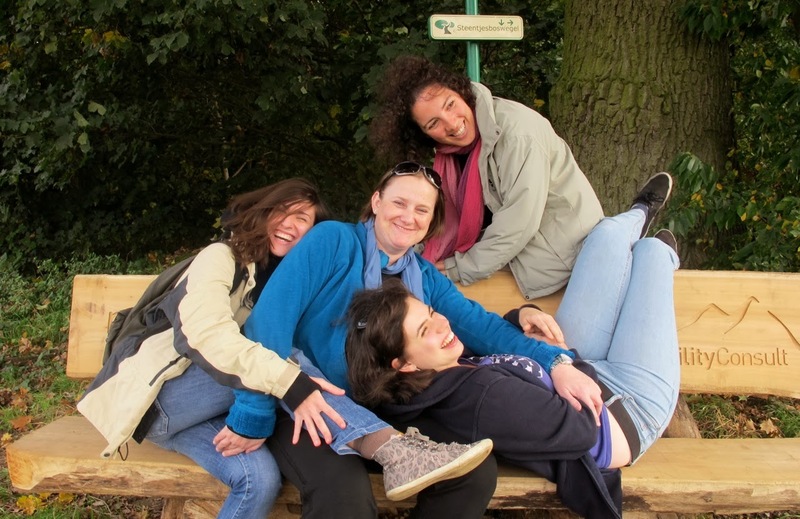 To attract families and youth groups, the Steentjesbos now has a totem pole, nature play area and a bench bearing Natuurpunt and Sustainability Consult’s logos, thanks to our contribution. Since our first year of operations, we have supported non-profits. We’ve donated to Pump Aid, Solar Aid and we bought a cow for the Seaweed Centre Zanzibar to help improve the lives of local women. Being members of 1% for the Planet brings this giving to another level. 1% is a group of responsible businesses worldwide who are committed to building a better planet. Their tagline is ‘Love Blue’ because 1% companies respect the earth and want to protect it. They take their impact seriously and seek to minimise it by supporting grassroots environmental movements. I’ve been reflected a lot on something William McDonough, father of the cradle-to-cradle movement, said at Sustainable Brands in San Diego in June. He said it’s not about doing “less bad” but about doing “more good”. This is so powerful and has been front of mind for me since then as I reflect on how we as a small business can do as much good as possible. Being independently-owned, it is easier than if we had to please shareholders. We’re not like most consultancies who just obsess about billing targets and screwing the competition. That has never been and will never be how we operate. We have strong values and ethics that are reflected throughout the company and the amazing people who work in it. Our Team has never been better, stronger and more united in our dual goal of providing incredible service and doing good than it is today. I feel so fortunate to be doing what I love with people who are as committed and passionate as I am. I believe that the way we can do more good and extend our reach is through our community and that’s why I am so proud of the Steentjesbos project. Our 1% of 2012 sales has enabled Natuurpunt to make this woodland more accessible to the public. We work with our community in different ways from organising monthly Green Drinks Brussels and Sustainability Communications Lunches, to buying local organic food and being a member of Belgian CSR network Kauri. To me, 1% for the Planet is the jewel in the crown of our sustainability commitment. I was thrilled recently to become the first European Ambassador for 1% for the Planet. The opening of the Steentjesbos is the first step in our journey of doing good as part of 1% for the Planet’s ‘Love Blue’ movement. As I wrote in our press release, I feel incredibly humbled that the everyday work we do helping people communicate credibly can result in opening up this beautiful Belgian woodland. I thanked our clients who have made it possible by working with us and I praised the dedication of my colleagues at Sustainability Consult. What’s next for us? We’re already thinking about what to do with our 1% of 2013 sales and we’re celebrating our fifth anniversary in November so watch this space. And if you fancy a walk in the woods, just 20 kilometres from our Brussels office, let us know. We’ll be happy to guide you round this very special place. Is CCS The Solution For Europe?